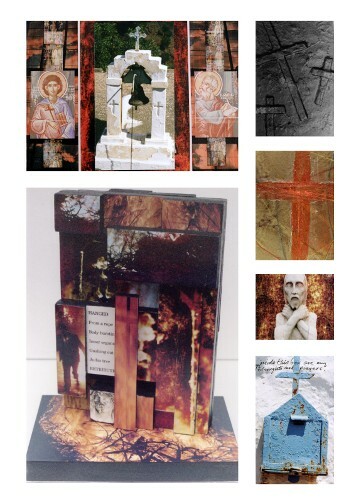 Having trained as a sculptor but now using the photographic medium: my work links photo images to mark making, three dimensional relief and constructions to develop and extend the boundaries of photographic manipulation and presentation. This is achieved without the aid of digital/computerised technology. Scratching, cutting, ripping, mark making, overlaying, adding texture and developing the shape, format and construction of finished works are central to the working process. In the creation of ideas I do not necessarily attempt to depict the actual concept of things, but the impression that it makes on one's inner emotions. The single image will be a long way from expressing the composite result. By stepping outside the natural boundaries of the photographic medium I am searching for a totally new synthesis. For me photography is alchemy, seeing photographic vision to form compatible combinations and to generate radical new forms of visual expression. Work is undertaken in urban and rural environments in the UK and abroad. The chosen sites have to hold something 'special', clicking creative forces in the mind: and not necessarily to do with photography as I am not totally confined to a singular medium. When working on location one experiences it, putting forward contemporary and contrasting observations which in turn produces imagery that maintains an element of mystery, yet showing some disclosure of reality. I am now producing publications,these touch on a variety of past projects over the past 5 years.